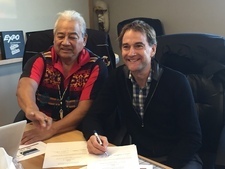 VERNON, British Columbia -Tolko and Splatsin, the southern-most community of the 17 that make up the Secwepemc Nation, have a long and cooperative history of working together to pursue mutually beneficial opportunities. In November, this relationship took another step forward with the signing of a Letter of Intent (LOI) that further strengthens the partnership. Splatsin sees this partnership with Tolko as bringing to life these words of its ancestral leaders. The LOI will lay the foundation for a cooperative working relationship that will benefit Splatsin and Tolko as well as the regional economy. The LOI outlines the establishment of a joint administration area; the development of strategies and plans to manage Splatsin’s and Tolko’s relationship; the establishment of business, employment and joint venture opportunities; and building capacity for long-term sustainable employment. Splatsin is the southern-most community of the 17 that make up the Secwepemc Nation. There are three reserves, Salmon River, Enderby, and Sicamous, and more than 900 members. More than half the membership lives off reserve. The Splatsin have a long history in the forest industry. Splatsin men were instrumental in the Shuswap River log drives that occurred every year. For more information visit: https://www.splatsin.ca/. Tolko Industries Ltd. is a private, Canadian-owned forest products company based in Vernon, British Columbia. With more than 3500 employees, Tolko is a major producer and marketer of lumber, veneer, plywood, and oriented strand board, with manufacturing operations across Western Canada. The company’s woodlands operations have been recognized by third-party certification of its sustainable forest management systems. For more information, visit www.tolko.com.